This is undoubtedly my favourite opening quote from the Little Black Classics series thus far. During these sticky summer months, however, it’s arguably more wonderful to lie in a hammock in shorts and a T-shirt, with a book and a glass of fruity Pimm’s to hand, as was my situation when reading this Little Black Classic. It was genuinely idyllic. Nestled in this situation, I soon become absorbed in Kenko’s social commentary, punctuated with anecdotes and observations. Kenko takes readers through life’s experience – friendships, relationships, death, and more specific events and factors, like inheritance, the weather, annual festivals. These are, at times, rather disjointed – rather like Hebel’s fables last week they vary in length and don’t have much continuity or flow. Fortunately, I enjoyed this classic so much more than last week’s. These musings are beautifully translated. Take the line: “there is something dreadfully lacking in a man who does not pursue the art of love.” Pure poetry. This once more made me think of my friend Hafez. 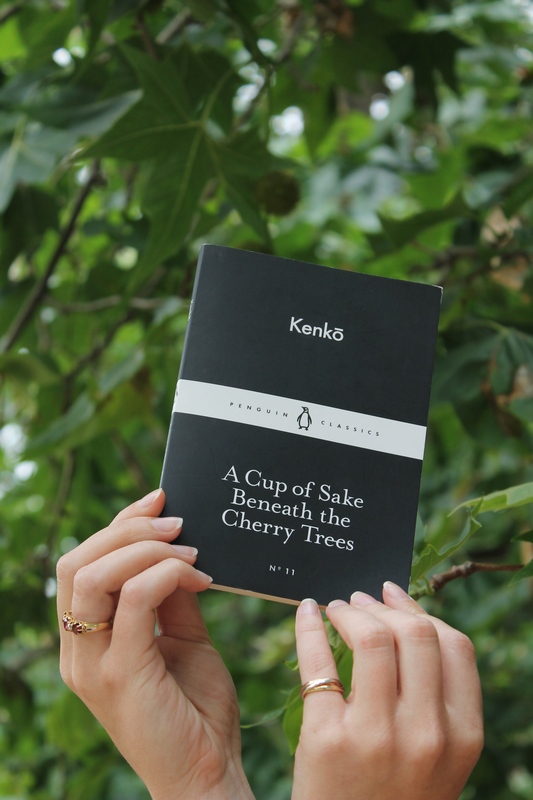 Like The nightingales are drunk, the writer’s life dances across the pages in A Cup of Sake Beneath the Cherry Trees. He’s full of opinion and humour and honesty and is forever contradicting himself. I relish the changing seasons and we are lucky to have such distinct seasons here in the UK. As much as I love Christmas, the long months of winter we suffer throws a constant black cloud over me, which my friends and colleagues can confirm. It’s winter blues with an attitude problem. Similarly, summer leaves me somewhat disenchanted. I like the BBQs, and lighter evenings and aforementioned Pimm’s, but we all seem to forget the hay fever, heat rash, bug bites and sweaty train journeys until the day of arrival. Like Kenko, it’s Autumn and Spring that I really relish. Autumn for it warm hues and crisp decay and family traditions. And Spring for new it’s new life and bursting green. It’s a charming reward after the bleak British winter. In February 2016, when a colleague comments on my slumped shoulders and cranky attitude I will quote this. No doubt giving more reason to call me a grumpy and protentious git. Kenko’s musings aren’t all so profound and evocative. Alas I have many friends that fit into the first category of seven, excluding one or two that I leave you to identify. I am lucky enough to have many wise friends and a doctor friend is moving into my flat in just a couple of weeks. Kenko would approve. This is not to say that everything Kenko writes strikes home or is, at the very least, amusing. His description of death left me cold and lonely – surprising for a buddist monk. They’re too chilling to record here – if you’re intrigued, please read yourself. Similarly, there are various sections which have a definite underlying misogyny. Not a great start but I was willing to give Kenko the benefit of the doubt. Where to start?! Aside from the heinous remark about her appearance as an old woman (how did Kenko look in his old age, I wonder?) and the fact that I’m sure if she didn’t run the house well it would be cause for complaint, why is it depressing to “watch her bear children” when Spring is so celebrated? Despite this misogyny, I really enjoyed this Classic, particularly Kenko’s view on friendships. With this in mind, I texted my dear friend Naina, who chose this week’s Classic, and asked if she would join me in a cup of sake. Naina grew up in Hong Kong, and first tried sake on a trip to China. We met on a library tour at uni (yes, we were those people) and it was instant love. 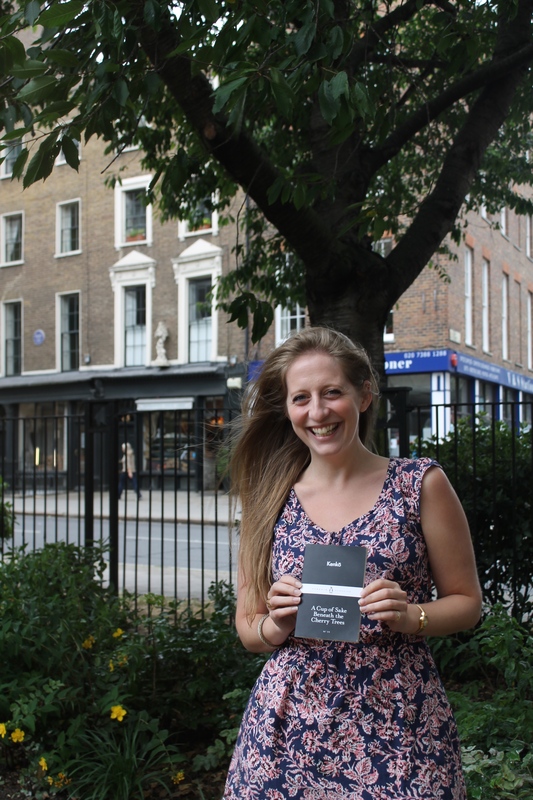 She recommended we head to Hare & Tortoise, a short walk from the British Library, for a bottle of sake and some sushi. My friends told me a bit about what to expect beforehand, and kindly corrected my pronunciation (I showed my naivety here). As previously discussed, it’s rather warm and muggy in the UK and so Naina and I decided upon a cold bottle of the Japanese rice wine as opposed to hot. It was served with tiny glasses that you essentially shot and it was delicious – perfectly cooling and sweet, and without the acidity of a grape wine. I’m smacking my lips at the memory. This was accompanied with some delicious sushi and a hearty catch up, which Kenko would probably have approved of to a point, before making a generalisation about women gossiping. We walked off our sushi, strolling toward Naina’s bedsit, which is the epitomy of how I imagined London life as an adolescent. Hidden behind a Leaky Cauldron-esque door, a winding staircase lined with botanical prints, hanging crookedly, leads the way to Naina’s front door. Every time I mount those stairs I am reminded of the staircase landlady Mrs Crupp leads David Copperfield up to his first rented London accommodation. Naina’s home overlooks a small public garden, which is conveniently lined with cherry trees. She sung of their blossom, which sadly fell a month or so ago. Some cherries still cling to the branches, thus far undiscovered by peckish birds. 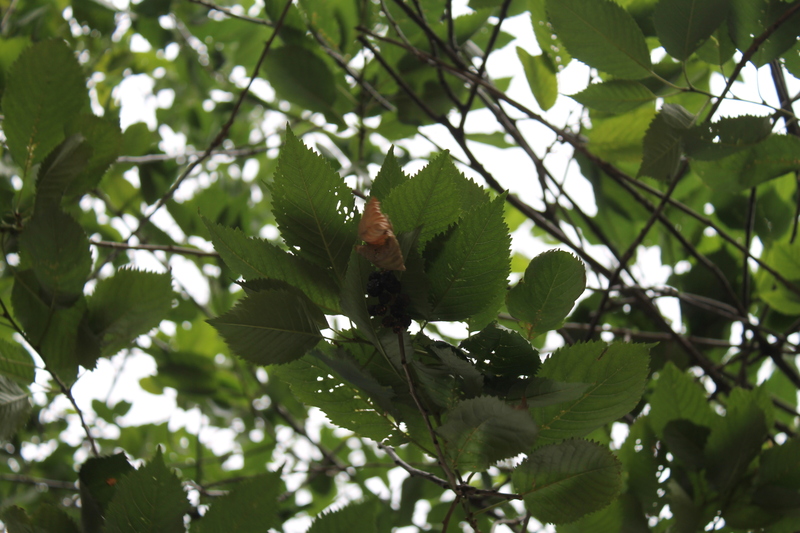 After looking for the last clinging fruits, we settled under a horse chestnut tree, which had a low hanging canopy, making the perfect shelter for a light rain shower. Typically unpredictable British weather. Here I told Naina of Kenko and she read a few extracts, agreeing the opening quote it perfection. 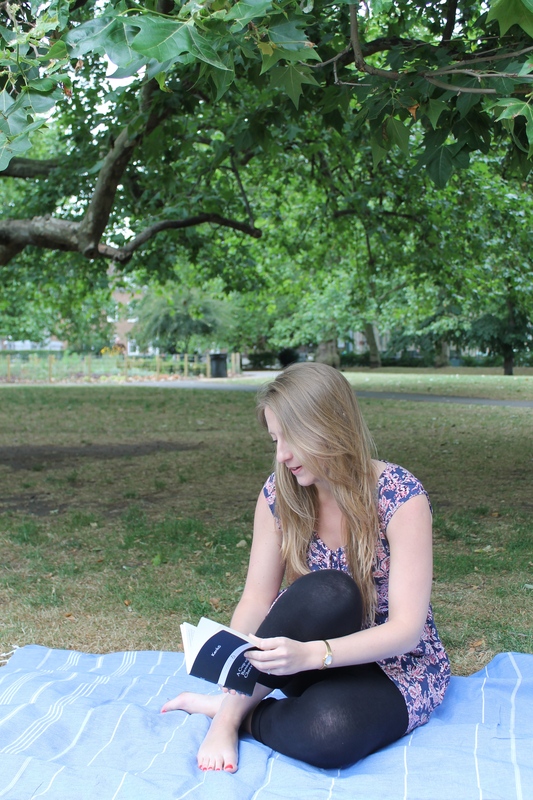 In the words of Kenko, I so enjoyed sitting with this book spread before me, communing with someone from the past. 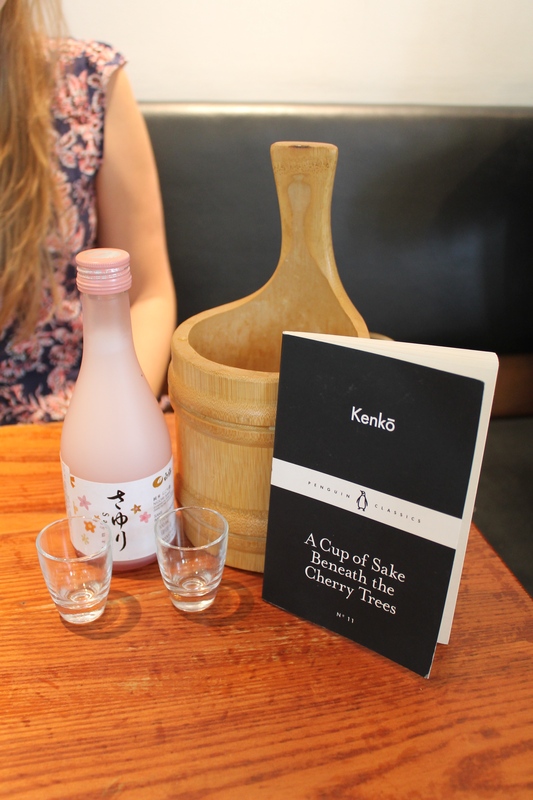 Thank you so much, Naina, for choosing A Cup of Sake Beneath the Cherry Trees, and for letting me mercilessly point my camera at you. 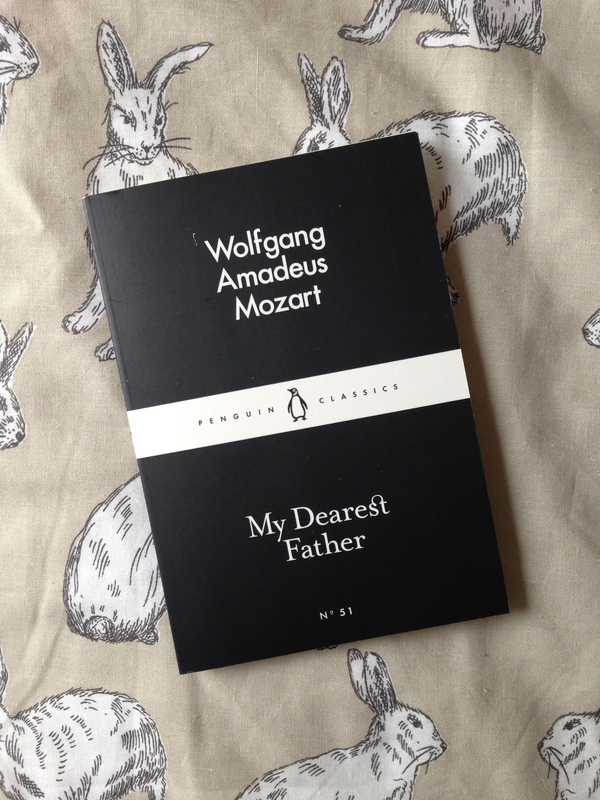 Next week I will be reading My Dearest Father by Wolfgang Amadeus Mozart.